Aglialoro now realized that the only way to make it happen was to do it himself. After all these years, he would still need a screenplay, to find a director, to cast the movie, to secure locations, and, most importantly, to start principal photography; and to accomplish all this in less than 90 days. So, on April 23, 2010, Aglialoro boarded a plane in Philadelphia bound for Hollywood to meet Harmon Kaslow, an attorney and motion picture industry professional who "knew how to get things done". They hit it off immediately and Kaslow came on board that day. Aglialoro agreed to personally commit the funding, the next day they hired a screenwriter and within a month, the crew had expanded to one hundred. The issue of the screenplay still needed to be addressed. Past experience showed that even the most talented screenplay writers could not condense the book into a single movie script, so Aglialoro decided he would follow the three part structure of the book and produce Atlas Shrugged as a trilogy. With the clock ticking, the screenwriter was commissioned to write a screenplay that encompassed only the first part of the book. They had some good luck and some bad luck. Good luck was that Hollywood was not booming in the spring of 2010 so talent was available to join the production immediately. Bad luck was that the first draft screenplay was simply unusable. Luckily, Paul Johansson, a friend of Kaslow's and a fan of Ayn Rand whose directorial debut won an Emmy Award, was available and interested in directing. Johansson's energy and passion was exactly what the producers needed to assemble a cast and crew that would be able to produce a theatrical quality motion picture in such a short amount of time. 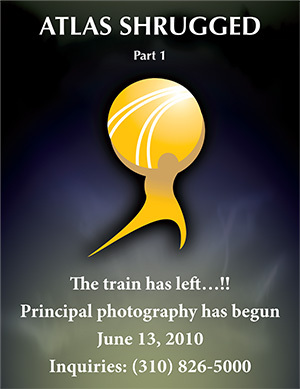 History was made on June 14, 2010 when a full-page ad appeared in Daily Variety, the entertainment industry's trade periodical, announcing that Atlas Shrugged Part I was in principal photography.